The accused came to meet under trial Jayesh Patel and showed the fake card on the entrance. 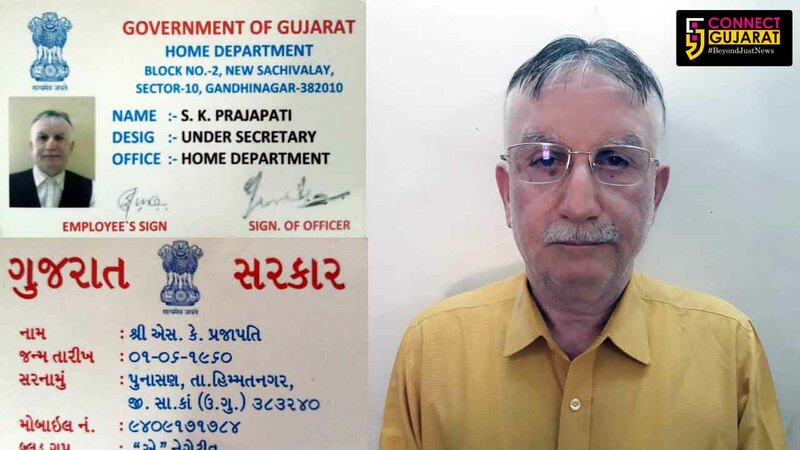 Vadodara crime branch arrested a person using fake Gujarat Home department identity card to enter the high security Vadodara central jail premises. The accused came to meet under trial Jayesh Patel and showed the fake card on the entrance. As per the details Sankabhai Prajapati from Punasan village in Himmatnagar Sabarkantha reached the Vadodara Central jail and showed the fake ID card to the on duty policeman mentioning himself as the under secretary of Home department and visit to meet Jayesh Patel and wants to meet the jailor for the same. As he showed the home department ID card the policeman opened the door and the another one asked him to enter his details on the register. However he denied as under secretary of home department don’t have to enter their name but still the policeman entered his details of entering the central jail. However the on duty staff found his activities suspicious and checked the ID card and found no one of such name in the home department at Gandhinagar. As jail officials investigate further as he said to be godbrother of Dr. Parul Patel daughter of Jayesh Patel and cried in front of him. She requested him to meet her father inside the jail as he is not well. On Sunday he reached the central jail showed the fake id card to the on duty policemen and tried to enter the high security premises. A complaint was registered in crime branch by Jail Subedar Ranjitsinh Chauhan after the accused was caught and he was produced before the court where the police get two days police custody remand of him. During investigation it was revealed that the arrested accused never serve at any government office in Gujarat and went to home department for his private works. He made the fake id card of him about 24 years ago and knew Dr. Parul Patel and she request him to meet her father inside the central jail as he is unwell. However he thought the jail authorities not allowed him to meet Jayesh Patel directly so he used the fake id card to enter the jail premises. Police is further investigating about how the accused prepare the card and from whom? Secondly if he used the card anywhere else and for any financial benefits in the past. Previous articleHow to make your own DIY “eco-friendly” Ganesh Idol?